a80+ flight ground test without overhaul demonstrated by RD-0120. b Operates from numerous non-space launcher bases. All can carry personnel or payload, but are automatic, autonomous vehicles. oxidizer mass is always many times greater than the fuel mass: it is the oxidizer that affects the mass of propellants the most. Reuse and sustained operations implies that the returned vehicle is ready for another flight after an inspection. With today's rocket engines this is improbable, because they are designed for minimum weight and not for sustained use, as aircraft engines are. 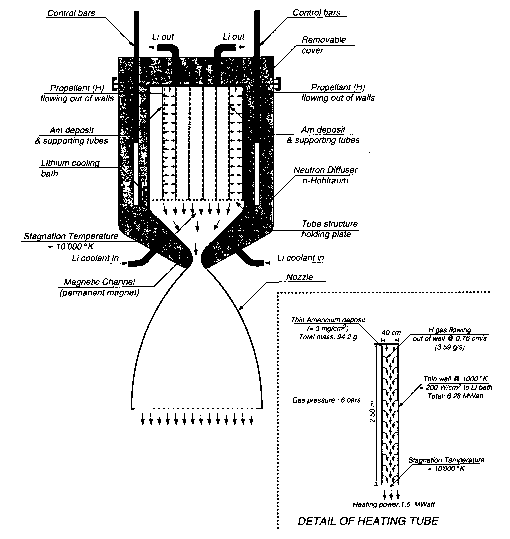 Designing rocket engines for sustained use would require readopting the philosophy in place for the XLR-129. Flights before overhaul is indicative of an operational system that has sustained operational capability and need not be refurbished after every launch. In 1964 the goals for the vehicle to support the Manned Orbiting Laboratory (MOL) and the XLR-129 was 100 flights before overhaul. One of the serious impediments to commercial operations is that there is only one launch site available per launcher. This may be acceptable for the commercial communications satellite organizations, just as operations from one coal mine was acceptable for the first commercial railroad train in York, England. A commercial space transportation system will have to have the characteristics of a UPS or Federal Express system to be truly commercial. Until the launchers are designed for a lower mass ratio, say, four or less, that will not be practicable. When a mass ratio of four or less is achieved the entire concept of operations will change, because with the correct hypersonic configuration and propulsion system the time-consuming vertical assembly, fueling and month-long count-down will be eliminated. Runway operations will become the norm, opening more launch and return sites for distributed operations. Orbital plane change and offset maneuvers will be far more economical whether executed in ascent and not from orbit. Another item in the table is applicable to TSTO. This is an important consideration. Most of the analyses discussed in this chapter were done for SSTO because this requires only one vehicle, offers the best approach for sustained operations, and is the most challenging. SSTO, however, can look, and be, too much like a one-size-fits-all solution. The advantage of a TSTO solution is the payload to orbit flexibility. An SSTO with a 7 metric ton (15,435 lb) payload to orbit is a hypersonic vehicle with an empty weight (OEW) about 70 metric tons (154,300 lb) and a gross weight (TOGW) of about 380 metric tons (837,900 lb). That is a mass ratio to orbit of 4.9. The payload to Earth orbit is 10% of the vehicle empty weight that carries it. This means, whether people or support supplies, the payload is always 7 tons. However a hypersonic glider, that is the second stage of a TSTO, with a 7 metric ton payload can be carried by a first stage that stages at Mach 11 and that has an OEW of about 35 metric tons. So the payload to Earth orbit is 20% of the vehicle empty weight that carries it. The first stage OEW is about 38 tons, for a total empty weight of 73 tons (161,000 lb). The total gross weight of the two stages is about 210 tons (463,000 lb), with the second stage gross weight at about 94.5 tons (208,500 lb). That means a total mass ratio of 5.0. If the second stage were a cargo-only, expendable cylinder, then for the same gross second stage weight the payload would be about 17.5 tons (38,600 lb). The payload to Earth orbit is 50% of the vehicle empty weight that carries it. The gross weight is the same, so the mass ratio is the same. Thus there is much more flexibility in the payload variety and weight that can be delivered to Earth orbit. In addition, the offset or orbital plane maneuver would be carried by the first stage flying as an aircraft in the atmosphere, not the stage reaching orbital speed and altitude [Czysz and Vandenkerckhove, 2000]. The propulsion conclusions apply to TSTO as well as SSTO.